The North Carolina Aquariums are in the running for USA Today’s Readers’ Choice Award for best aquarium, and everyone’s vote counts. The aquariums are asking for visitor support by going online and voting for the USA Today’s 10Best Readers’ Choice travel award contest. Participants may vote for their favorite once per day, until voting ends on Monday, April 22 at noon ET. After being selected by a panel of experts, the North Carolina Aquariums, which include aquariums at Fort Fisher, Pine Knoll Shores, Roanoke Island, as well as Jennette’s Pier in Nags Head, are competing head-to-head with big names like the Florida Aquarium, Georgia Aquarium, Monterrey Bay Aquarium, and National Aquarium in Baltimore. Last year, the North Carolina Aquarium at Pine Knoll Shores placed ninth in the nation. The North Carolina Aquariums and Jennette’s Pier sit nestled in coastal areas, surrounded by the beauty and vitality of sounds and wetlands. Each location serves as a living illustration of the connection to the natural world. The 10Best Readers’ Choice Award contest launches new categories every other Monday at noon, revealing each category’s 20 nominees. After four weeks of voting, the contest closes at noon on the 28th day. Winners are revealed on the Friday after voting ends. Rules allow the public to vote online for one nominee per category, per day. Nominees for all categories are chosen by a panel of relevant experts. The panel includes a combination of editors from USA Today, editors from 10Best.com, relevant expert contributors, and sources for both these media and other Gannett properties. All voting is digital and the 10Best Readers’ Choice Award contest is accessible on the 10Best.com website. 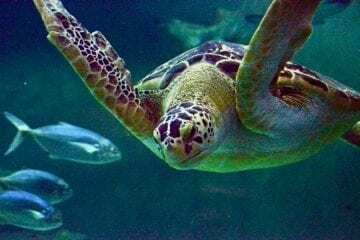 Vote for the North Carolina Aquariums at www.10best.com/awards/travel/best-aquarium-2019/. For more information about the North Carolina Aquariums visit www.ncaquariums.com or call 252-247-4003.